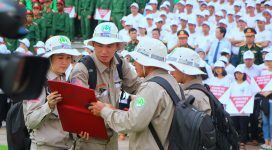 Trieu Phong, Quang Tri (23 August 2016) – Nearly a half century after the Ho Chi Minh Trail was first put into use during wartime, RENEW teams are still destroying unexploded ordnance found along the route. 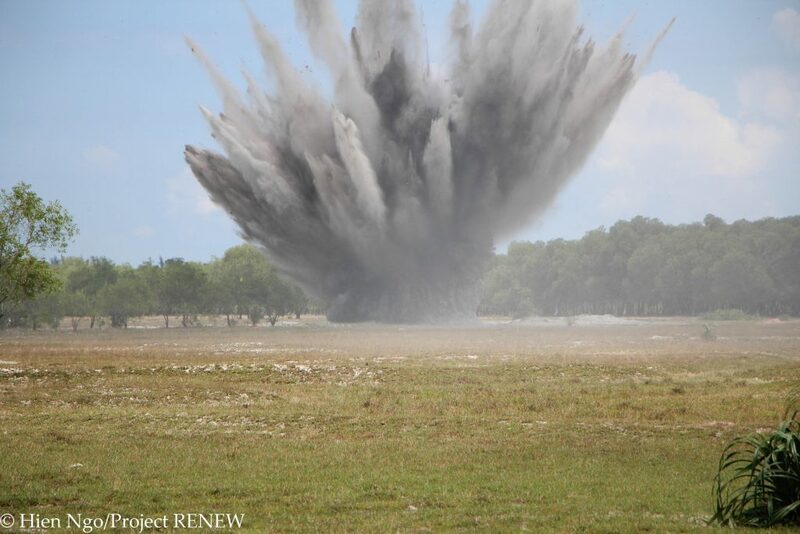 Today 19 items including aerial bombs, projectiles, rocket warheads and mortars were safely destroyed by RENEW’s teams at the demolition site in Linh An Village of Trieu Trach Commune. 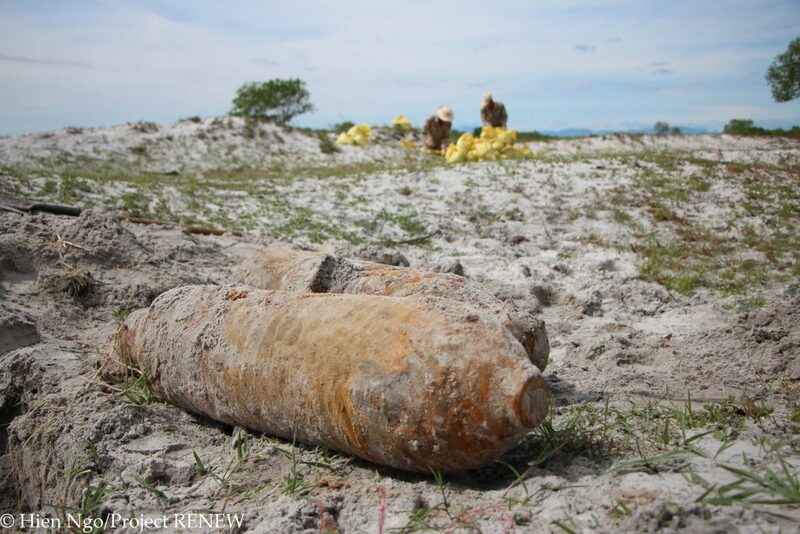 The unexploded munitions were discovered at an agricultural development site along the Ho Chi Minh Highway that runs through A Bung Commune, Dakrong District near the Laos border. The current modern roadway was built along the same route as the historic Ho Chi Minh Trail, a rugged jungle and mountain track which brought thousands of troops and tons of materiel and supplies from north to south during wartime. On Monday, in response to an emergency request from the Provincial Military, Project RENEW dispatched EOD Team No. 3 to A Bung Commune where an engineering unit had uncovered many large caliber munitions while clearing a site for agricultural development as part of the Greater Mekong Subregion project. After arriving at the site and conducting identification and assessment, the RENEW team and the engineering unit worked together to remove and transport the munitions to RENEW’s Trieu Phong demolition site for destruction. Transport of the munitions was safely completed before dark fell. Two AN-M30 100-pound GP bombs, aka fragmentation bombs, are among the munitions awaiting destruction today at RENEW’s central demolition site. They were among 19 items discovered by an agricultural development team working along the Ho Chi Minh Highway, the former jungle route that supplied troops and supplies to the south during the war. On Tuesday morning, members of EOD Team No. 2, assisted by Cluster Munitions Remnants Team No. 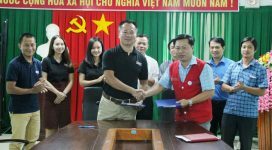 8, arrived at Linh An Village and started their work under leadership of RENEW’s National Technical Officer. Triggering three consecutive controlled demolitions, the team finished their work just before lunchtime. The UXO destroyed included two AN-M30 100GP aerial bombs, ten projectiles of 105, 155 and 175mm, three rocket warheads and four mortar rounds. 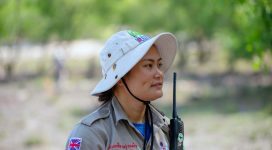 During the first eight months of 2016, as a result of the EOD quick response and cluster munitions remnants survey process in Quang Tri Province, RENEW teams have conducted 1,152 demolitions and safely destroyed 12,533 items of UXO.